The real kings of the ovals, BriSCA Formula 1 is the UK’s most spectacular, loudest and most supported short oval formula, with the drivers being household names among the fans and the race action bordering on unbelievable. Powered by 600bhp Chevrolet V8 engines and fitted with hefty steel bumpers, these leviathans shake the very foundations of the stadium with the roar and rumble of their powerplants and the clash of metal on metal, backed by the shouts and cheers of the crowd as they egg on their favourite drivers. The category featured in BBC1 documentary series Gears and Tears in 2010 and is also covered by the Premier Sports channel on Sky, and you can see the stars and their cars up close at all three of Incarace’s raceways. 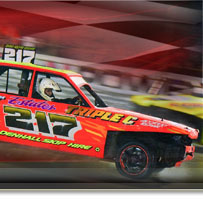 Some of the largest events in the Big League can be seen at the Incarace raceways, including The Thunder in the Hills event at Hednesford Hills Raceway in April, the European Championship at Northampton International Raceway in July over two days which also features the Bev Greenhalf Trophy, the World Masters at the same venue in September which always attracts a big overseas presence, and the Gala Night at Birmingham in November.